Bread makers are easy to use, quick to clean, and can even help you save energy if you use them instead of an oven for the smaller jobs. A bread machine is a kitchen appliance that gives you the ability to bake home cooked bread without having to spend hours in the kitchen. If bread makers are that great, why don’t we all have one? Perhaps part of the reason is that people aren’t aware of good bread maker recipes or how many things can be made with one. When it comes down to it, bread machines are misunderstood. Bread machines can be used for so much more than just your basic white loaf. 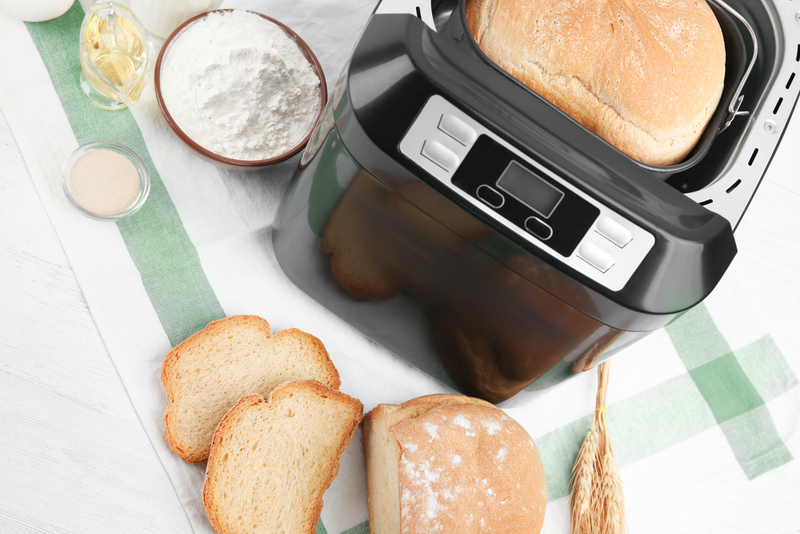 Do you want to know how to get the best out of your bread maker? 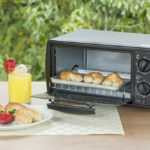 Read these five tips on how to use a bread maker to make delicious homemade bread and other foods first. Once you’ve mastered the basics, you can move on to the delicious and easy bread maker recipes. Try these five great bread maker recipes from cinnamon buns to ring donuts and bagels. 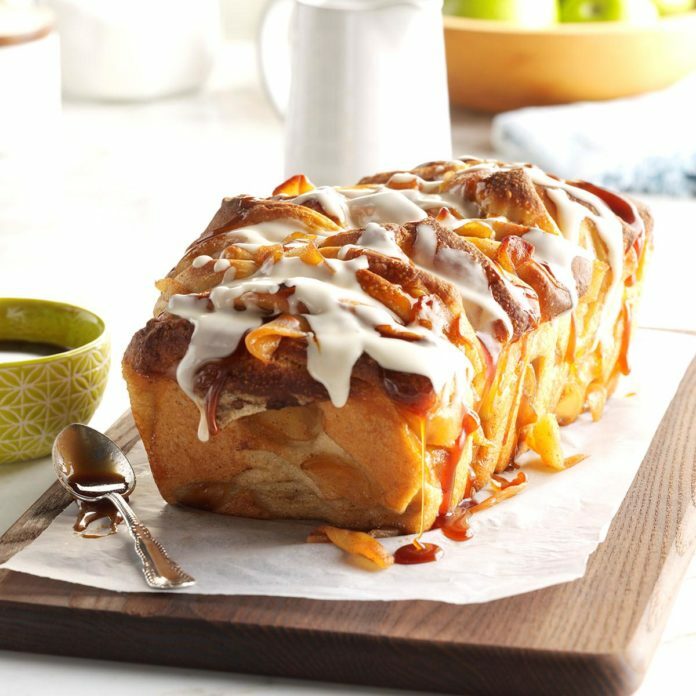 This bread maker recipe from I Heart Kitchen has converted a basic sweet dough bread maker recipe into a delicious apple filled pull-apart loaf. Fill your house full of the aroma of cinnamon and sugar, that nostalgic smell that will take you straight back to your childhood. Add the dough ingredients in the order listed into your bread machine. Select dough cycle, push start, and allow the dough to run the full cycle. Remove the dough once it has finished the cycle, and place it on a lightly floured surface. 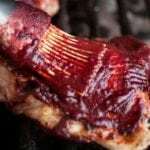 Cover it with a dish towel and allow to rest 10 minutes. 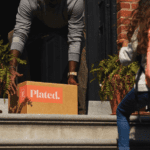 Roll it to a 20″ x 20″ rectangle. Dice the apples and mix them with the cinnamon. Spread the mixture over the dough. Use a pizza wheel to cut the dough into 2″x2″ squares. Stack the squares into small piles and gently place the piles into the pan sideways. Continue this until each pan is full. Cover with a tea towel and allow the bread to rise for 30 minutes. Preheat oven to 400 degrees, then bake the bread for 25 – 35 minutes or until it is golden brown. Remove the bread from the oven and cool it on a rack. Don’t forget to remove the parchment paper while it’s warm. Make the glaze by mixing in the vanilla and gradually adding milk until the glaze is a thick pouring consistency. Drizzle it over the bread. This delicious chocolate swirl bread recipe is perfectly suited for a sweet breakfast and will go fantastic with a hot cup of coffee or tea in the morning. 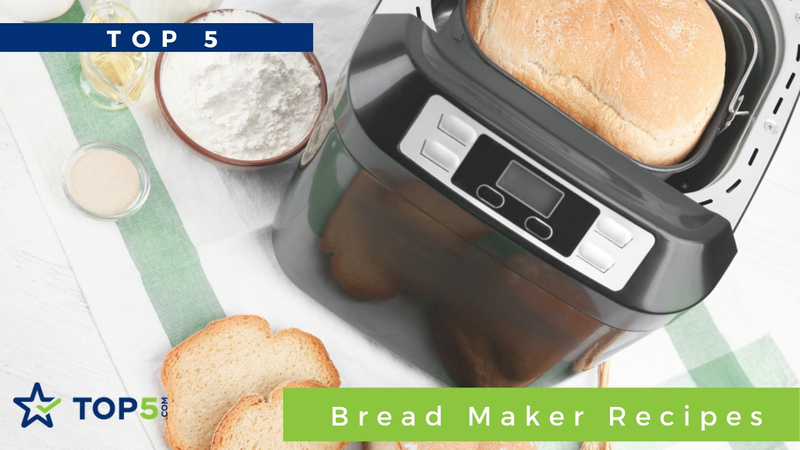 Don’t hesitate to add this bread maker recipe to your collection. Put fresh milk, condensed milk, and unsalted butter in a rice cooker on “Keep Warm” for 10 minutes. Add half of the beaten egg, raw sugar, salt, bread flour, and cake flour. Dig a small hole and pour in the yeast. Select “8” dough program (or equivalent) and start. The bread machine will mix and knead the dough. Once the dough is ready, take the dough out and flatten it. Divide into 1/3 and 2/3 portions. Shape the 2/3 portion into a ball, and mix the 1/3 portion with 10g Cocoa powder. Cover and let dough rest for 15 minutes. Roll out both portions with the width corresponds to the length of the bread pan. Cover and let rise for about 30 – 40 minutes. Spread the rest of the egg on the top of the bread using a basting or pastry brush. Select “Bake program; crust color” and start. Once bread is baked, transfer it to a cooling rack. 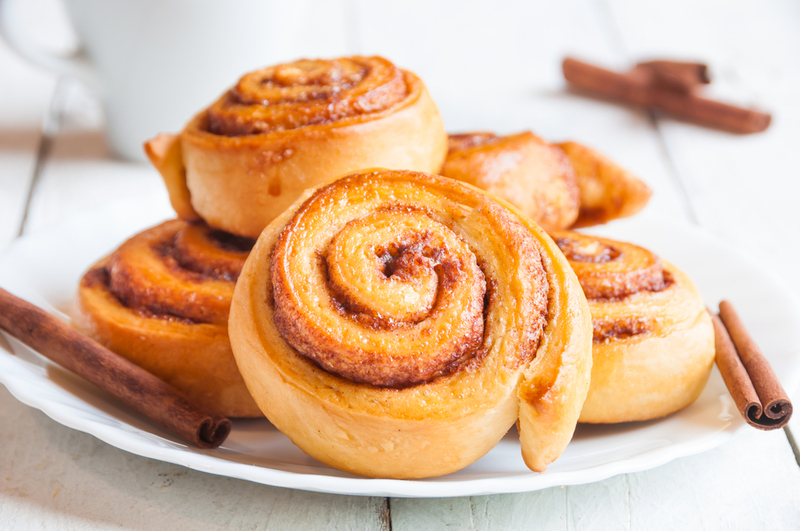 Cinnamon buns are most commonly served in Northern Europe and North America. If you’ve got a sweet tooth, this tasty cinnamon roll recipe is for you. It’s a simple and easy bread machine recipe that you’ll want to make regularly. Put the yeast in the bread machine with the flour, sugar, and salt. Melt the butter in the microwave, then add the beaten egg, milk, and water. Add it to the dry ingredients in bread machine on the dough setting. When the dough is done, transfer it to a lightly floured surface. Knead in enough flour to make it easy to handle. If it is still too elastic, cover and leave to rest for 10 minutes. Use a floured rolling pin to roll out dough on floured surface into a rectangle shape approximately 1/4-inch thick. Spread the filling over the entire surface of dough with the spoon, then roll up the dough. Cut into circles with a sharp knife about 1-inch thick. Place these in a greased 9×13-inch pan. Cover the pan with a tea towel and leave to rest in a warm place for approx. 30 minutes until double in size. Bake in a 350° oven for about 25 minutes until lightly brown on top. After the rolls are done, make the glaze and drizzle it over buns. Have you ever wanted to make your own homemade donuts? This great bread maker recipe is just what you need! Mix the warm milk, the yeast, and sugar. Let it rest for 10 minutes. Mix the salt with the flour. Put the bread machine onto the dough cycle. Pour in the milk with the yeast and sugar, then add the eggs, flour, and butter. Press start and wait. When the dough is ready, shape, cover and let it rest until it doubles in size. Knead the dough to remove the bubbles. Roll the dough to 1cm thickness. Cut out the donuts with a cup. Cut a smaller hole in the middle (optional). Let them rest for about 30 minutes. Fry the donuts until each side is golden brown. 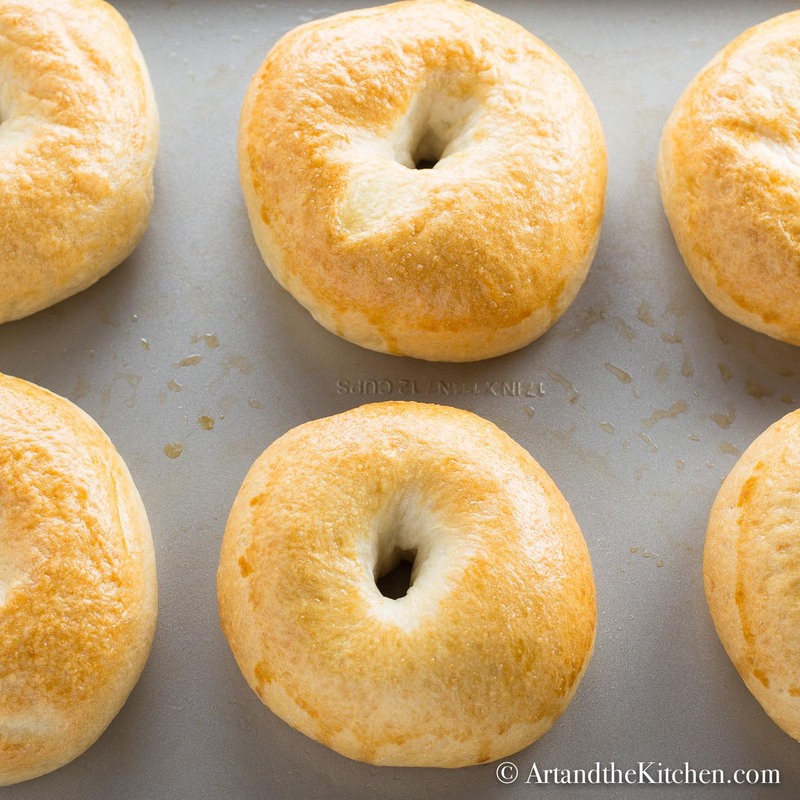 This bread machine bagel recipe from Art and The Kitchen is super easy and tastes great. This is one of the bread machine recipes that everyone will love. If you are after a bagel with a twist, finely chop some onions, pan fry them until they are translucent, and add them to the top of the bagels before baking. Place all ingredients in order listed into bread machine pan. Do not mix them in the machine. Insert baking pan securely into the baking unit. Select the dough setting on the bread maker and push the start button. When cycle is complete, remove the dough and transfer to a lightly floured surface. Divide the dough into 10 -12 equal portions. Roll into balls, then using your thumbs, make a hole in the center of each ball, working the dough until the hole is about 1 inch. When finished with each one, place it on a greased baking sheet. Grease the top of each bagel with soft butter. Cover with wax paper and a dry towel, then let it rise for 30 minutes. 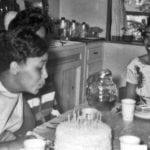 Meanwhile, bring 3 quarts of water and 1 tablespoon sugar to a boil. Reduce heat and lower as many bagels as can fit into the water. Simmer 1-2 minutes per side. Drain the bagels on a paper towel, then place them on the greased baking sheet. Brush the bagels lightly with egg wash. Prepare egg wash by whisking together 1 egg and 1 tbsp. water. Bake at 400º F for 25 to 30 minutes until golden brown. 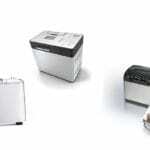 These are only five bread maker recipe ideas that can be made in a bread machine. However, there are so many more options out there for you to try and experiment with. 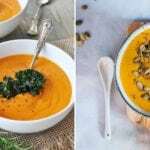 We hope this article has inspired you to get that bread machine and give these recipes a try. If you want to upgrade your bread machine or purchase a new one, check out our Bread Makers Buyer’s Guide, which will break down exactly what you need to look for when buying a bread machine.